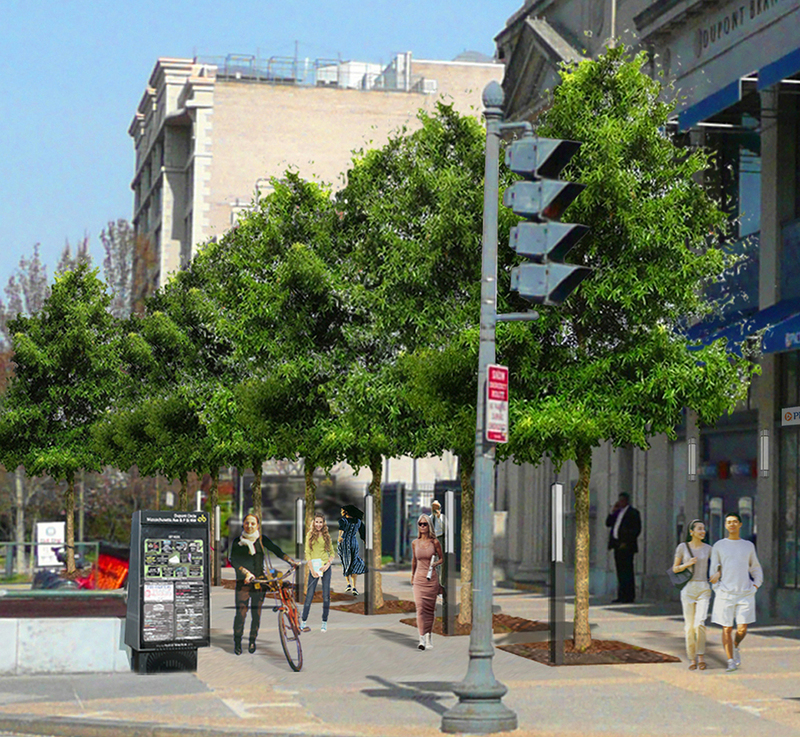 Restore Mass Ave's vision for a Tree Plaza - a grove of shade trees to replace the barren sidewalk where Massachusetts Avenue meets Dupont Circle - just took a giant step towards reality. RMA has contracted with Designgreen LLC, a firm expert in "green engineering," to investigate the site and seek funding to design and build the Tree Plaza with public or private funds. Neglected for decades, the 7,100 square feet of public sidewalk adjoins the PNC Bank. It has closed-off steps to the old trolley tunnel and two struggling trees. Yet thousands of workers, residents and tourists walk there daily. The Capitol BikeShare station there is one of three busiest in the city. 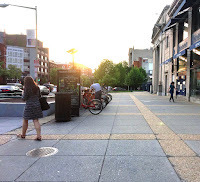 Steps away is the Metro Red Line Dupont North exit, used by 10,500 riders each weekday. At least 18,000 vehicles pass daily, spewing exhaust. Ground-level air is hot and hard to breathe even in mild weather. "This site is a wonderful location to showcase a sustainable green retrofit," says Rebecca C. Stack, the Designgreen principal. A number of city agencies make grants to local groups to retrofit paved areas to lower storm runoff into city drains and rivers. The District needs to capture more stormwater and cool ground-level air in order to meet federal water and air standards. RMA's Tree Plaza project likely qualifies for such funding. 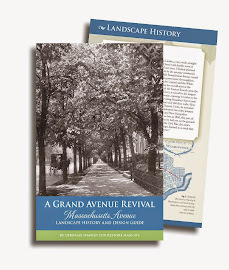 Restore Mass Ave has tried for years to get a city agency to take ownership of the problem, to no avail. RMA also found that no other Dupont group has plans for the site. Yet the community wants the site transformed. In 2015 the Leo A Daly architecture firm created a concept plan and renderings to show the RMA Tree Plaza vision (below). Now Designgreen's expertise in engineering, storm water management, and city programs can make it happen. RMA may enlist partners to carry out the project. 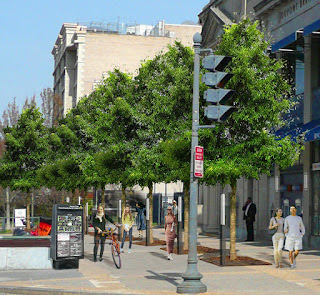 Robin Diener, President of the Dupont Circle Citizens Association, says: "In the absence of city leadership, DCCA is thrilled that RMA has taken the lead in figuring out how to turn this site into a welcoming shaded community space. "DCCA welcomes Designgreen as the catalyst for making it happen," Diener says. Go here for RMA Tree Plaza press release and testimony by RMA President Deborah Shapley. Image of Dupont Tree Plaza Leo A Daly/RMA. Photo of the site on April 27, 2017 is by RMA.